Basic Research, Education and Development Society (BREAD) was founded in 1989, primarily to disburse scholarships to needy, bright students. Now, with the Andhra Pradesh Government’s recently introduced scheme for scholarships, BREAD has shifted its focus to establishing libraries in schools. The design of the program has been done as such that BREAD doesn’t duplicate government activities, but instead creates a niche for itself to improve the quality of education. BREAD enables the students of the schools to take responsibility and manage the libraries. Teachers are also incentivized for inculcating the habit of reading, without putting the burden of library management on them. Thus, the program remains lean. In this manner, BREAD has established 400 libraries since FY10. An additional 150 libraries have been set up in the current year (FY14) so far. Given the caliber of the Board members, BREAD has a distinct advantage in terms of funds utilization: there is no salary expense for any team member, and the network of well-wishers has resulted in several costs like rent, transport, printing, database and website management, etc. being waived off altogether. Thus, BREAD’s funds are almost entirely available for direct program spending. Total Income and Accumulated Reserves: The total income raised by BREAD in FY13 amounted to Rs1.9mn. This is slightly higher than the total income of FY12 (Rs1.7mn. not including transfers from reserve funds). While it appears that the donations to BREAD have been declining in the recent years, this is not a cause for concern at the moment, as the organization plans to utilize its sizeable reserves for implementation of the program. The current year’s (FY13) carried forward surplus was Rs0.18mn, while the year-end balance of general reserves and earmarked funds was Rs5.6mn and Rs2.9mn respectively. Investments and Interest: The largest source of funding in FY13 was interest on investments, amounting to Rs0.7mn (38% of total income). Interest was earned on fixed deposits and government bonds, closing balance of each being Rs5.7mn and Rs2.9mn respectively at the end of FY13. 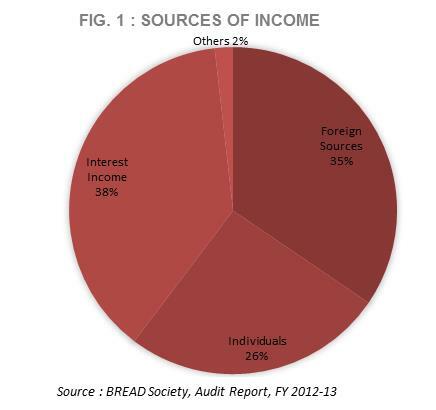 Foreign Donations: Income from foreign sources (institutional and individual) formed the second largest contribution to the total income in FY13 (Rs0.6mn). This is an increase of almost 78% over the foreign donations raised in FY12. Individual Donations: Donations from local individuals amounted to Rs0.5mn, slightly higher than the amount raised in FY12 (Rs0.43mn). Program vs. 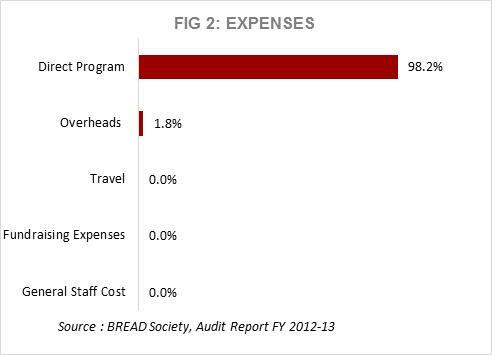 Overhead Expenses: As mentioned earlier, BREAD is able to deploy over 98% of expenditure directly towards program activities, as it does not incur expenses for staff salaries, rent, transport, etc. The quantum of program spending in FY13 was Rs1.6mn, which was about 64% lower than that of FY12. The two main reasons for this are: the number of libraries started in FY13 were 100 (as against 160 in FY12), and a major part of the cost for FY13 (library book expenses) was incurred in March 2012, and therefore, booked in FY12. Further, only one rural study center functioned during FY13, as BREAD is now focusing on the library program. The amount reflected in our financial template under “Program Salaries” pertains to the honorarium paid to external trainers for conducting coaching sessions for entrance tests, soft skills, etc. Fixed and Current Assets: BREAD has negligible fixed assets (less than Rs5,000). Balance cash-in-hand and at bank at the FY13 year-end were also minimal (below Rs10,000). Current assets closing balance amounted to Rs0.05mn, of which 98% pertained to TDS receivable. Income Growth Rate (IGR): The IGR of BREAD is very erratic, possibly because income is raised mostly through known sources and can be raised as per need. FY13 saw an IGR of almost -65%, whereas the rate for FY12 was +62%. Self-Sufficiency Ratio (SSR): The SSR of an organization measures its ability to raise funds from steady sources of income such as beneficiary fees, interest, individual donations, etc. BREAD’s SSR in FY13 was on the higher side, mostly because of its reliance on individual donations and interest income. The SSR of FY13 was almost 73%. If we include the donations from foreign individuals, the SSR in FY13 is boosted to around 107%. The SSR of FY12 was 95%, but is influenced largely by the transfer of Rs3.6mn from reserve funds. Corpus: The corpus fund of BREAD is around Rs0.06mn only (by way of membership fees). However, as mentioned earlier, the earmarked funds (Rs2.9mn) and the general reserves (Rs5.9mn) provide a level of assurance as of now. Logistics: Libraries are set up in remote villages, and while the initial transport of books is easily done through bulk transporters, it is the subsequent additional sets of books/registers which need to be periodically sent that are a challenge to transport. This is because the packages are too small for a bulk transporter to deliver feasibly, but at the same time are too large for the postal service. This challenge is also faced at the time of prize disbursements to students. The schools have to be continuously reminded to make their arrangements to collect their packages or prizes. Student and Teacher Motivation: The main determining factor to the success of the program is the utilization of the library books. This, being extra-curricular reading, requires special motivation. This is a challenge that is being addressed by BREAD by awarding headmasters, teachers and students who proactively make use of the library. Further, handing over the responsibility of library management to the students has helped with the motivation levels as well. BREAD does not consider finance or advocacy to be major challenges at the moment. BREAD has 22 members on its Governing Board for the term 2012 to 2014. The Board’s President is Mr. K. Padmanabhaiah, retired Secretary to the Government of India (Ministry of Home Affairs). The two Vice-Presidents are entrepreneurs and the two Mentors, Dr. P. C. Rao and Mr. M Narasimhappa were formerly the Secretary to Government of India (Ministry of Law) and the Chief Commissioner of Income Tax (Pune) respectively. Dr. P. C. Rao is currently a Judge at the International Court of Justice (The Hague). Mr. Ramamohan Rao Kakani, Secretary of the Board, is the retired Deputy Advisor to the Planning Commission. The rest of the Members of the Board are either entrepreneurs, social workers or people from literary backgrounds. BREAD has been able to draw on the skills of its Board, in order to save costs. For example, the Vice-President has created the MIS database. The website is also being maintained pro bono by well-wishers. Mr. Sudhir Kodati, Founder of Rural Library Foundation has partnered with BREAD to provide voluntary district co-ordinators in almost all districts of Telangana. Printing work, order co-ordination, transport and office space have all been provided free of cost through supporters of the program. BREAD is registered with Give India.